Pre-drawn marketing charts symbols represent target, dart, global, check box, sign post, etc. These symbols help create accurate diagrams and documentation. Marketing diagram templates offer you lots of special shapes, target, dart, hit the target, global, check box, check or cross, dollar, coin, euro, pound, bag, sign post, scales, warehouse, wholesaler, cylinder, shopping, etc. 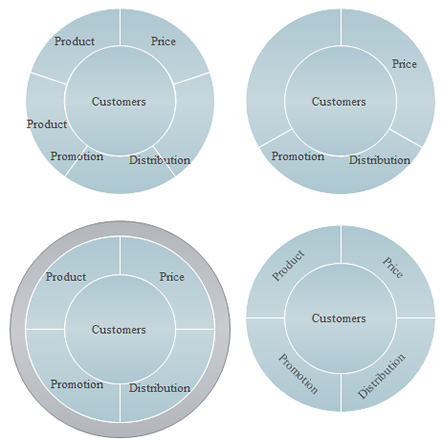 All the marketing diagrams shapes will greatly help you draw the marketing diagram you like. Target is an object, a place or something else that selected as the aim of an attack. Dart is a small pointed missile that can be thrown or fired. Checkbox is a small area on a computer screen which, when selected by the user, shows that a particular feature has been enabled. Wholesaler is someone who buys large quantities of goods and resells to merchants rather than to the ultimate customers. A wholesaler is an intermediary entity in the distribution channel. Wooden barrel is a hollow cylindrical wooden container. Oil barrel is (abbreviated as bbl) is a unit of volume whose definition has not been universally standardized. In the United States and Canada, an oil barrel is defined as 42 US gallons, which is about 159 liters or 35 imperial gallons. Shopping cart is a small wheeled vehicle with two or four wheels typically pushed by hand. Medal is a piece of round or oval metal awarded to a person or organization as a form of recognition for sporting, military, scientific, academic, or various other achievements. Stop sign is a traffic sign to notify drivers that they must stop before proceeding. Warning sign is a type sign that indicates a hazard ahead on the road that may not be readily apparent to people. Market analysis is a method used by investors to look at the market and try to determine whether it is going up or down. PLC, short for Programmable Logic Controller, is a digital computer used for automation of electromechanical processes. 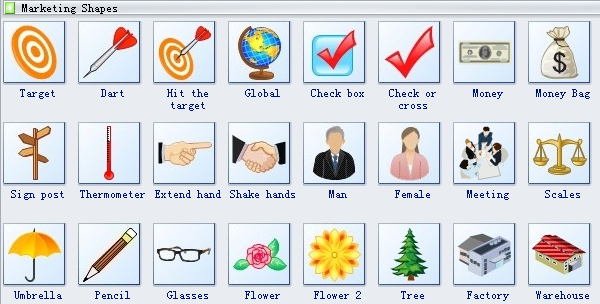 These symbols are all extraordinarily easy to get and modify thanks to the action button and control handle. Take one of the most variable shapes - Marketing Mix as an example, see how you can make the most of it below. Select the shape or position the pointer over the shape to show the button and handles. Rest the pointer over the button to show its menu. The action button enables diversified styles of a single symbol. See the effect yourself in the pictures below. Of course, there are still more possibilities such as apply another theme, change the line style or insert some clipart and so on. It is all up to you. 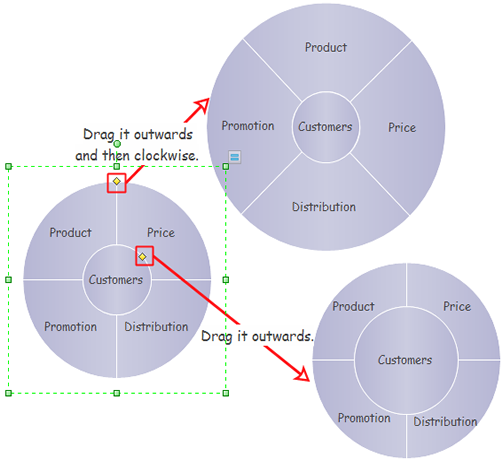 Please go to this page for a detailed explanation about how to beautify your diagrams. If you need to do more alterations, use the control handles. One is on the edge of the inner circle. The other is on the outer edge. Aided by this smart feature, your drawing becomes a lot easier and more creative. Need fresh looking marketing charts symbols for your design? These marketing charts symbols are a cinch to pop in. And their crisp, fine detail will make spectacular, easy-to-understand diagrams and presentations to your customers.